The last couple of grands prix have not gone as well I hoped they would, but I've put that behind me now and am just looking forward. I wasn't driving badly, we just didn't quite get the car in the best place and I was struggling a bit with the tyres. 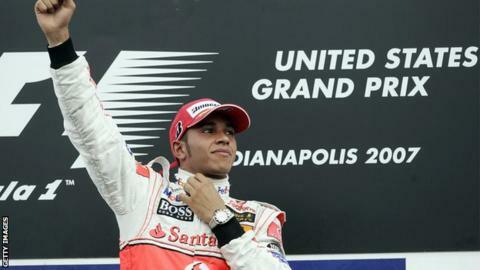 Hopefully, this weekend, at the United States Grand Prix in Austin, Texas, will be different. The most important thing at the moment is for me and my team-mate Nico Rosberg to get the points we need to secure second place in the constructors' championship for Mercedes. We're in a good position - thanks to our results in India and Abu Dhabi we have edged ahead of Ferrari. Now we have an 11-point lead to protect in the final two races in Austin and Brazil. Second place in the constructors' might not sound a big deal, but for the team it's huge. It means millions of pounds in terms of prize money, but even more importantly it is a huge step for the team. It will underline how much progress we have made since last year, when the team were fifth, and it's no less than we deserve. We have the second fastest car - which is a great achievement in itself after the difficulties the team had in 2012 - so it's only right we should finish second. It would be a great boost for Mercedes to see a real reward for all the effort they have put into the team. I've been in the US since Monday, doing a bit of media work in New York and Los Angeles ahead of the race. I did NBC, CNN and a couple of other things. It's very different from doing the same in Europe or Asia because F1 is not as well known in the States. Sometimes it's a bit weird because the interviewer doesn't always know a great deal about the subject. I love America. I always look forward to coming here. It has so much to offer as a country. There are great cities such as New York and LA, Miami and Las Vegas, all brilliant in their own way and all so different. And then there are 50 states and the landscape has so much beauty and diversity. I've travelled a lot around the country and every visit I have had such a good time. It's such a big place and they are crazy about sports here, but the majority of them don't know much about F1. In Europe, it's part of the culture. Here, if they know motorsport at all, it is Nascar and IndyCar. But I feel like F1 is starting to grow here and I really hope it does. It's great to explain to people that an F1 car is on a totally different level from a Nascar or IndyCar. It would absolutely kill them in terms of speed. The race in Austin really feels like one that can, finally, properly establish F1 in the States. I was at an event on Wednesday and there were so many fans there. And the first race here last year had a huge turn-out, one of the biggest crowds of the year. It felt a lot like Silverstone, with all the grandstands and spectator areas completely packed. They say that F1 has struggled to attract interest in America, but I don't think that's true. We go to some countries and people just don't care about it. That's not the case here at all. People here are crazy about their sports and I think they feel that if there is a big sporting event coming to a city near them. There are a lot of F1 fans here; it's just that it has not yet made a massive impact on the population at large. Hopefully, this race will be the springboard for more races in the States. How cool would it be to have one race in Texas, another New York and another in LA or Vegas? It would be incredible. America is a big enough country to justify that. I've won both the US Grands Prix I have competed in - one at Indianapolis in 2007, after a really close battle with my McLaren team-mate Fernando Alonso, and then again here in Austin last year after another close fight with Sebastian Vettel's Red Bull. In some ways it was a surprise to win last year. Sebastian was so quick through practice and qualifying but in the race I was able to stay with him and eventually pass him for the win. F1 is strange like that. Sometimes when the car has been not that great in qualifying, it will come alive in the race; other times, it is the other way around. It will be tough to win here again this weekend, though. Sebastian and the Red Bull are just so strong at the moment. Before I finish this column, I wanted to mention the people in the Philippines who have been struggling in the aftermath of Typhoon Haiyan. I've been to the Philippines to do work for Unicef and it's such a lovely place. It's so sad to see the tragedy there. It's hard to imagine what the people there are going through after a tragedy like that, losing their houses, or friends or family. I have them in my prayers every day and I am going to do what I can to help them.